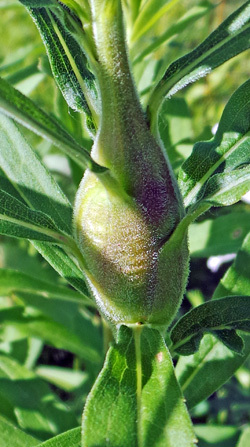 Spherical gall on Canada goldenrod caused by goldenrod gall fly. Goldenrods are a common wildflower, painting fields, prairies, and meadows yellow in late summer. Canada goldenrod (Solidago canadensis) is an aggressive native plant that is quick to colonize disturbed areas, including gardens, that many people wish to keep out, but it does support a very specific and unique fauna. 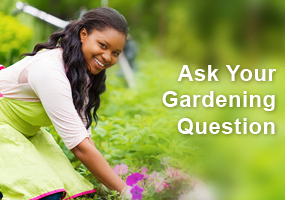 As it finishes flowering and starts to decline, ball-shaped swellings on some of the stems become more noticeable. 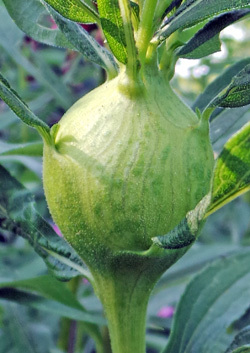 These spherical swellings are galls produced by the goldenrod gall fly, Eurosta solidagnis. It occurs from coast to coast throughout much of central North America from northern Canada south to Kansas and the Carolinas. This tephritid fly completes its entire life cycle only on goldenrod. There are distinct races of this species that are specific to different species of goldenrod, only laying eggs on Canada goldenrod, late goldenrod (S. altissima), or giant goldenrod (S. gigantea). Goldenrods are clonal, spreading by rhizomes, so that all of the stems in a clump are genetically identical. 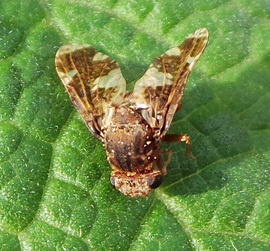 The clones differ in their suitability for gall formation and preference by the flies. The female flies choose the correct plant by “tasting” it with chemical sensors on the feet and antennae as they walk over the buds. In the spring female flies deposit eggs singly in rapidly growing goldenrod stems. Even though a female may lay several eggs per stem, each stem generally ends up with just a single gall. The eggs hatch after several days and the tiny white to cream-colored larvae begin feeding inside the stem in which they hatched. The maggots are ovoid in shape and without a distinct head capsule. The larval fly’s saliva contains a chemical which is thought to mimic plant hormones so it causes the plant to grow abnormally. 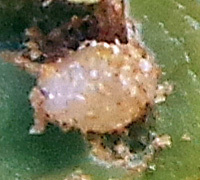 In response to the insect’s feeding, the plant increases cell production at the site of injury, forming a gall that becomes apparent about 3 weeks after the eggs are laid. Initially the gall is the same size and color as the stem, but eventually grows to nearly the size of a golf ball and often has a reddish tinge or is mottled purple. The leaves near the gall wither and turn brown. The rounded gall has a hard, corky exterior layer and the center contains specialized nutritive tissues – about the consistency of damp wood – that the fly larvae eat. As each gall expands, the solitary larva inside eats out the center of the gall to form a chamber in which it lives. The galls don’t seem to have a debilitating effect on the goldenrods plants, which still bloom despite the gall. In the fall the gall turns brown and hard. Gall cut open to reveal feeding chamber and maggot within. 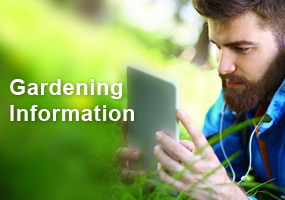 The larvae feed throughout the summer, molting twice and growing to about ¼ inch long. In the fall, in preparation for its exit the following spring, the mature larva chews a tunnel to the gall’s surface, leaving just a thin layer over the opening to the outside. From the outside the exit tunnel looks like a pinhead-sized dark spot near the middle of the gall. The larva enters diapause as a third instar larva to overwinter inside the gall. Cold temperatures induce the larva to convert glycogen into glycerol and sorbitol, which serves as antifreeze by reducing the water content in the body so ice crystals do not form and cause cell injury. In the early spring the larvae pupate inside the gall, with the adult flies emerging in mid-spring, after the goldenrod stems have started to emerge. Since they have no mouthparts they cannot chew their way out of the gall, but instead inflate a balloon-like structure between the eyes to push open the thin covering. Once outside they inflate their wings. Adult goldenrod stem gall flies are smaller than a housefly, with the males slightly smaller than the females. Females have a tubular ovipositor extending from their abdomen. They both have patterned wings – translucent with mottled brown splotches – but spend more time walking on goldenrods than flying since they are clumsy fliers. During the approximately 10 to 14 days they live, their only activity is to mate and lay eggs on young goldenrod stems. The males wait on the terminals of the plants, “dancing” (rapid, side-to-side rocking movements) when a female approaches. After mating, the female moves away to find a suitable place to lay its eggs. Galls tend to occur in patches, as the flies don’t move very far from where they emerged. A goldenrod gall in midsummer. Even though the larval flies are protected inside their galls, they still are still used as food by other animals. Two species of chalcid wasps (Eurytoma gigantea and E. obtusiventris) are parasitoids of the larvae. The adult female wasps deposit eggs through the tender growing gall tissue into the interior chamber with a long ovipositor. When the wasp eggs hatch the larvae feed on the fly larvae, and the following spring the tiny black adult wasp emerges instead of the fly. The tiny beetles Mordellistena spp. also feed as larvae on the gall fly larvae inside the gall. Some birds, especially downy woodpeckers and black-capped chickadee, are predators of the larvae, breaking into the galls to get to the fly larva in the middle. Ice anglers in some places collect the galls to cut open to use the larvae for fish bait. The wasps find it easier to parasitize smaller galls, while woodpeckers prefer the largest ones. In areas with lots of wasps there are more big, thick-walled galls; the galls tend to be smaller in places with many woodpeckers. But in locations where both wasps and woodpeckers are abundant the galls tend to be of intermediate size. 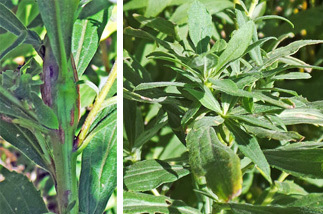 Other galls on goldenrod on the stem caused by a moth (L) and in the terminal bud by midges (R). 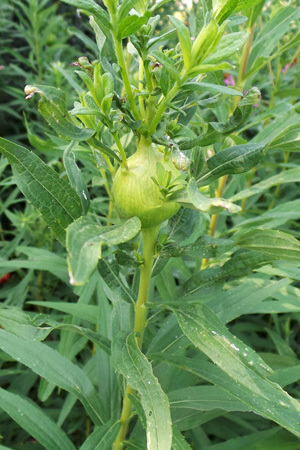 Other galls are relatively common on goldenrod, too. 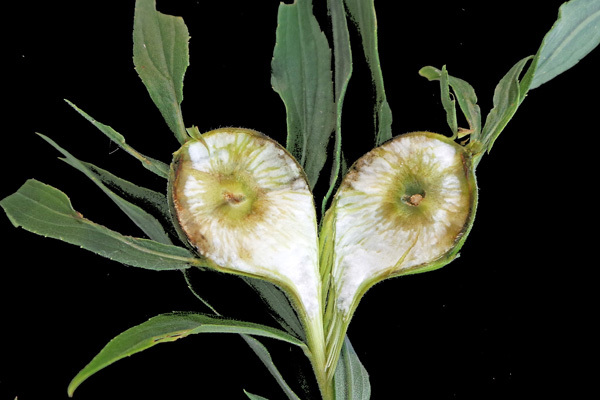 The moth Gnorimoschema gallesolidaginis induces spindle-shaped or elliptical galls to be formed on the stem, while the goldenrod bunch gall midge Rhopalomyia solidaginis causes a closely bunched, rosette-like cluster of leaves to form in the terminal bud only on Canada goldenrod. I became interested in galls in the mid 90’s. At that time little was known about the life cycle of the goldenrod gall fly and how it triggered the plant to develop the gall. This article was very fascinating. Much is now known. I was especially intrigued by the fact that they survive the winter by converting glycogen into glycerol and sorbital to act as an antifreeze. Amazing adaptations. I am doing an art installation and have collected quite a few galls with stems. I have epoxied tacks to their stems and there are sticking out of the wall. ( The exhibition is in. June). I am wondering if the larva will still hatch inspite of being in a warm room for a few months. Should I varnish them to inhibit the larva ? In other words would anyone know what can I do to stop the larva from hatching? I have noticed these galls on Canada goldenrod for years and not known exactly what they were. It was fascinating to learn about the life cycle of the goldenrod gall fly. 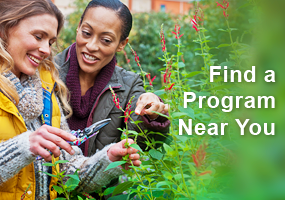 Of particular interest was the fact that the larvae convert glycogen into glycerol and sorbitol, which serves as an antifreeze to keep them alive during winter. It was also interesting to learn that, since they lack teeth to chew themselves out of the galls in the spring, they inflate a structure between their eyes to push their way out. I have noticed some holes in the galls in the fall, which I now know are made by predators (e.g., wasps, beetles and birds) that love to feed on the tasty little larvae. Being the occasional ice fisherman, I will be gathering some of these galls myself in the hopes of catching a “big one” through the ice.